Zhū Xī (朱熹; Wade-Giles: Chu Hsi; 1130 – 1200 C.E.) was a Confucian scholar of the Song dynasty who became one of the most significant Neo-Confucians in China. Philosophically, he is famed for his successful synthesis of all the disparate strands of Neo-Confucian thought into a coherent and elegant system. Further, he also maintained a classical Confucian concern with political involvement and proper action in the world. Zhu Xi's most important contribution to Confucianism was his moralization and ordering of the cosmos. By describing the primary cause and nature of the universe as Principle (li), he created an orderly and inherently meaningful world where an "investigation of things" (be they natural phenomena, classical texts or human interactions) was said to reveal the fundamental nature of reality. Applying Zhu Xi's ideas to human beings creates an optimistic ethical framework whereby anyone can achieve moral excellence by thoughtfully cultivating their hearts-and-minds (xin). Socioculturally, Zhu Xi’s greatest impact was the posthumous selection of his writings as the basis for the imperial examination system, causing them to be studied intensively from 1313 to 1905 C.E. As the reigning orthodoxy in Korea for the six hundred years of the Yi dynasty (1392–1910), his teachings have deeply shaped Korean attitudes, etiquette and culture. It is likely for these reasons that Life magazine ranked Zhu Xi as the forty-fifth most important person in the last millennium. Zhu Xi was born in 1130 C.E., at the beginning of the Southern Song dynasty, in the town of Youxi in Fujian Province. In traditional Confucian style, he was schooled in the rites and classics by his father, a lesser official in the imperial bureaucracy. After receiving this education, he followed in his father's footsteps, breezing through the entire gamut of imperial examinations before his nineteenth birthday and accepting a position as a district keeper of records in 1151. Despite the prestige of being accorded such an elevated position at such a young age, he eventually realized that his true calling was in scholarship, causing him to seek the instruction of Li Tong (an able Confucian scholar who had studied with Cheng I). Zhu Xi became entirely committed to this scholastic path, so when his term as record keeper ended in 1158, he chose not to return to the service of the imperial bureaucracy. At this time, Zhu Xi took a position as a temple curator—a post that allowed him numerous opportunities to study, to converse with luminaries from various religious and philosophical traditions, and also to meditate (jingzuo; literally "quiet sitting") upon his learning. Despite his academic focus, he also remained politically active, writing countless missives to the imperial throne critiquing policies and officials, and suggesting various means of improving (even "humanizing") government. In all, he remained a dedicated student and educator for 15 years (from 1163 to 1178), participating in many intellectual debates and writing influential commentaries on the Analects and the Mencius. However, even during this period of relative retirement, his commitment to the Confucian ideal of ‘engaged scholarship’ did not go unnoticed and, through the years, he received frequent requests to resume government service. Following one of these requests, Zhu Xi accepted a position as a district magistrate in 1178 and, in the subsequent 18 years, he also served as a minor official, a vice minister of the army department, a junior expositor in waiting, a district prefect of Fujian province and the governor of Honan. In 1179-1180, in addition to his duties as magistrate, he rebuilt the famed White Deer Grotto Academy and taught there, offering lectures that were attended by "all [the] prominent scholars of the time" (Chan 1963, 588). During this period of political involvement, he also managed to edit two other Confucian classics (the Doctrine of the Mean and The Great Learning) and to write commentaries on them. However, his outspoken criticisms of corrupt officials and his attempts to enact far-reaching reforms earned him many enemies, and his political fortunes were often uncertain, as he was frequently demoted and chastised by the throne and his fellow bureaucrats. These attacks culminated in 1196, when he was "accused of ten crimes, including refusing to serve and spreading false learning, and an official even petitioned for his execution. All his posts were taken away" (Chan 1963, 588). When he died in 1200 C.E., he was still in political disgrace and many of his teachings were seen as being unorthodox. In the years following his death, public conception of Zhu Xi underwent a complete reversal. After ten years of scholarly debate, his synthesis of classical materials and their Neo-Confucian counterparts was recognized as a watershed moment in Chinese philosophy. Likewise, in 1208, the emperor "posthumously honored [Zhu Xi] with the title Wen (culture)" for his tremendous service to Chinese philosophy (Chan 1989, 1). After Zhu Xi's public vindication, his prize pupil (and son-in-law) Huang Kan took it upon himself to write a laudatory biography (xing chuang) of the celebrated philosopher. Huang Kan felt such reverence for his teacher that he spent over 15 years preparing successive drafts and seeking comments and criticisms from all the leading intellectuals of the day. These honorific efforts reached their culmination in 1241, when Zhu Xi's funerary tablet was placed in the Confucian temple, placing him in the august company of Confucius, Mencius, and many of Confucius's most notable pupils (including Yan-hui, Zeng Shen and Zi Lu). Though it should be noted that not everyone agreed with his (re)construal of classic thought (as can be seen below), Zhu Xi's grand synthesis of virtually the entire Confucian tradition into a single cohesive philosophical system became the orthodox interpretation for over six hundred years. Given the classical lacunae on metaphysical issues (both Confucius and Mencius stressed concrete reality to the exclusion of metaphysical speculation), Neo-Confucian thinkers developed numerous explanations of the fundamental nature of the world. By Zhu Xi's time, the most important of these included Zhang Zai's theory that material force (qi) was both the generative principle for the universe and its underlying substance, the Cheng brother's (Cheng Yi and Cheng Hao) view that li was the basic nature of reality, and Zhou Dunyi's Daoist- and I Jing-inspired cosmological theory of the Supreme Ultimate (Taiji). Building upon Zhou Dunyi's understanding, Zhu Xi concurred that the source and sum of creation is the Supreme Ultimate (Taiji). The Tai Ji was understood as the cause of qi's movement and change in the physical world, resulting in the division of the world into the two energy modes (yin and yang) and the five elements (fire, water, wood, metal, and earth). Zhu Xi expanded upon this concept by positing that the Taiji was, in fact, the "principle of Heaven, Earth and the myriad things" (Chan 1989, 147). In this way, the nature of worldly things and their structure/function becomes tied to an overarching cosmic schema that guides their genesis and development (as in the Greek understanding of telos). By grounding principle in the Supreme Ultimate, Zhu Xi provided a cosmological foundation that had been lacking in the Cheng brother's doctrine of li. Despite the seeming preference for li in his system, Zhu Xi also stressed the fundamental necessity of qi. Specifically, he argued that vital force (qi) and rational principle (li) were mutually dependent, and that the existence of any form of matter depended upon their interaction. In his system, the concept of qi was "necessary to explain physical form, individuality, and the transformation of things. [Qi] is physical, many, transitory, and changeable, unequal in things, constituting their physical substance, involving both good and evil (depending on whether its endowment in things is balanced or partial), and is the agent of creation" (Chan 1963, 590). In this way, he also addressed Zhang Zai's doctrine of material force. The interplay between Zhu Xi's understandings of principle and material force were most pronounced in his view of human nature (as discussed below). Arguably, Zhu Xi's most important contribution to Confucian philosophy was his creative synthesis of these somewhat disparate theories. As a final cosmological point, Zhu Xi did not hold to traditional ideas of God or Heaven (Tian), though he discussed how his own ideas mirrored the traditional concepts. He encouraged an agnostic tendency within Confucianism by believing that the Great Ultimate was a rational principle, though he considered it to be an intelligent and ordering will that underlies the physical reality of the universe. As mentioned above, Zhu Xi posited that every physical object (including human beings) contains a principle (li) that is ultimately derived from, and has continued contact with, the Great Ultimate (Taiji). As such, the human mind (in an ideal case) is this supreme regulative principle at work in a person. In this way, ethics become an issue of ultimate importance, as one's ontological nature has the potential to be entirely good (and, simultaneously, to be entirely in harmony with the principle of the Universe). This statement is made explicit in Zhu Xi's conclusions on ren (the primary Confucian virtue, alternatively translated as "humanity," "benevolence," or "human kindness): "Master [Zhu] said: 'Mencius spoke about humanity [ren] being a person's mind.' This is a most fitting remark. Mind is naturally a humane [ren] thing. So long as we preserve this mind, then there is not need to worry that such a person will be inhumane" (Zhu Xi, 1.64). Likewise, he argues that the perfected mind rests in (or literally consists of) the cardinal Confucian virtues: "Heaven has only spring, summer, autumn, and winter. Humans have only humanity [ren], rectitude, propriety, and wisdom. These four are those four. Mind is what functions. There are only these four principles. There is nothing else" (Zhu Xi, 1.30). In this way, the human mind, which is purified through praxis (as discussed below), can ultimately be made to align perfectly with the supreme principle (li) of existence. For all of these reasons, Zhu Xi considered the earlier philosopher Xun Zi to be a heretic for departing from Confucius's beliefs about innate human goodness. As such, Zhu Xi's synthetic work (and his involved program of textual annotation and commentary) virtually ignored all the contributions made by Xun Zi. Through these two methods, he believed it would be possible to make one's mind congruent with the ultimate Principle of the universe. While Zhu Xi (and many other Neo-Confucians) incorporated meditation into their training regimens, it must be noted that it was not the same as the Buddhist dhyana (chan ding) that likely inspired it. Specifically, his meditation did not require the cessation of all thinking (as in Buddhism), but was instead characterized by quiet introspection that helped to balance various aspects of one's personality and allowed for focused thought and concentration. In this way, his form of meditation was highly Confucian, as it was concerned with morality and proper conduct: "Whenever you have to attend to your daily affairs, or undertake any matter, always spend some time in meditation and everything will be all right" (Zhu Xi, 4:25). In this way, Zhu Xi's quiet sitting can be as a meditative activity with a worldly (even practical) emphasis. This doctrine of the investigation of things also provided a means to re-emphasize the Confucian concern with proper ritual (li). This explains why so seminal a scholar devoted himself to the composition of Master Chu's Family Rituals, a tome written in the Song vernacular that detailed the specifics of "a variety of ceremonies dealing with human life from birth to death" (Berthrong, 109). In this way, Zhu Xi managed to ground his complex philosophical system upon a simple praxis regimen, one that simultaneously affirmed the necessity of action in the world and the transcendent spirit of human nature. While Zhu Xi's teachings dominated Confucianism for over six hundred years, his thought was not without its critics. During his lifetime, his political opponents accused him of all manner of heresies, denouncing his work as unorthodox and revolutionary. More significantly, dissenters, such as Wang Yangming, emerged and criticized his emphasis on principle (li). This led them to develop an alternate philosophical system, one that stressed the role of mind. Though their school was not as influential (likely due to Zhu Xi's place of honor in the Imperial examination system), it provided the impetus to many twentieth-century New Confucians, especially Mou Zongsan. Zhu Xi is a figure whose lasting impact upon Chinese life and society is practically immeasurable. 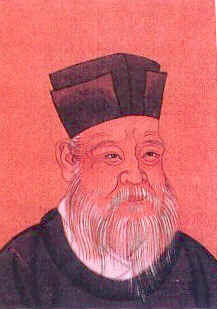 He and his students were responsible for formulating a concrete vision of the Confucian canon, dividing them into the Four Books (consisting of the Analects of Confucius, the Mencius, the Great Learning, and the Doctrine of the Mean) and the Five Classics (the Classic of Poetry, the Classic of History, the Book of Changes (I Jing), the Classic of Rites and the Spring and Autumn Annals). These distinctions remain prevalent into the modern day and provide a touchstone for anyone approaching these texts. More importantly, in 1310, his critical editions of the Four Books (which included redaction and commentaries) became the official textbooks for the Imperial examination system. As a result, the learning of all Chinese scholars and bureaucrats, from 1313 C.E. to the collapse of the imperial bureaucracy in the early twentieth century, was, to a very large extent, shaped by Zhu Xi's own perspectives. Likewise, his comprehensive ritual manual was tremendously influential, and is still used today in planning traditional Chinese ceremonies (especially in Taiwan) (Berthrong, 110). Philosophically, he is remembered as the grand synthesizer, who "made Neo-Confucianism truly Confucian, [stripping] it of the Buddhist and Taoist influence which had been conspicuous in previous Neo-Confucians" (Chan 1963, 589). His views, though not uncontested, remained the most systematic and influential statement of Confucian values from the time of their composition to the present. Indeed, the orthodoxy of his position spread beyond China: In Korea's Yi dynasty (1392–1910) his teachings were officially adopted as state orthodoxy, shaping Korean attitudes, values and etiquette in the country for years to come. In Japan, his teachings were dominant in the Tokugawa period (1603–1867). Ames, Roger T. The Art of Rulership: A Study in Ancient Chinese Political Thought. Honolulu: University of Hawaii Press, 1983. Chan, Wing-tsit. "The Great Synthesis in Chu Hsi" in A Sourcebook in Chinese Philosophy, 588-653. Princeton, NJ: Princeton University Press, 1963. Kim, Yung Sik. The Natural Philosophy of Chu Hsi (1130-1200). Philadelphia, PA: American Philosophical Society Press, 2000. Volume 235 of the Memoirs of the American Philosophical Society. Zhu Xi [Chu Hsi]. Further Reflections on Things at Hand. Trans. and commentary by Allen Wittenborn. Lanham, MD: University of America Press, 1991. “Zhu Xi” In Britannica Student Encyclopedia. This page was last modified on 3 July 2013, at 14:11.